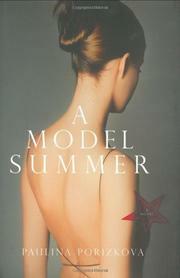 This fiction debut from iconic early supermodel Porizkova is the story of a wide-eyed teenager who gets a good look at the underbelly of the fashion world when she spends a summer modeling in 1980s Paris. A gangly teen living in Sweden, 15-year-old Jirina Radovanovicova is surprised when she is singled out by a fashion scout to work as a model in Paris. A child of Czech immigrants, with unusual dark looks, “frog eyes” and a gap-toothed smile, Jirina is teased by boys at school and barely tolerated by her unhappy single mom. With little more than some secondhand clothes and a paperback copy of Kafka’s The Castle given to her by her often-absent father, Jirina jets off to Paris, where she is assigned a room with Britta, another girl from Sweden. The room is in the apartment of their modeling-agency owner, Jeanne-Pierre, his disaffected former model wife, Marina, and their neglected toddler Olympe, with whom the teen bonds, figuring she could always become the child’s au pair if the modeling gig doesn’t work out. No chance of that. In spite of a few faux-pas, Jirina begins to get noticed for the knockout she is, and as her jobs increase, so do her adventures. A British hairdresser quickly dispatches with her virginity, and she nurses a raging crush on an Australian photographer while being pursued by a smitten young French journalist named Hugo. Her level head is turned by new experiences, good and bad, and there are predictable episodes involving drugs and treacherous fellow models. There is also, in her darkest hour, an opportunity to trade sexual favors for a plum job. Porizkova has enriched this story with details only an insider could provide. The alternately seductive and childlike Jirina possesses a refreshingly clear-eyed point of view and a solid moral compass.